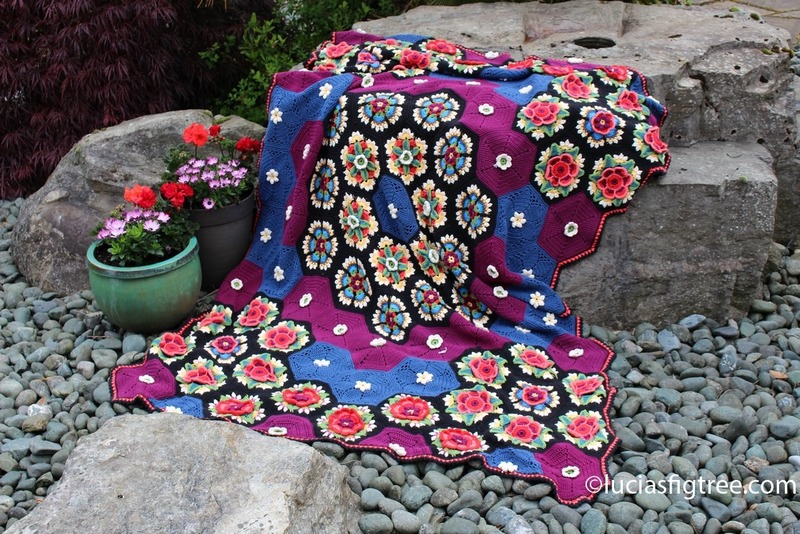 Many of you are probably aware of the new version of Jane Crowfoot ‘s Frida, and now, that the blanket has been published , I can tell you about this amazing project I have been so privileged to be involved with! 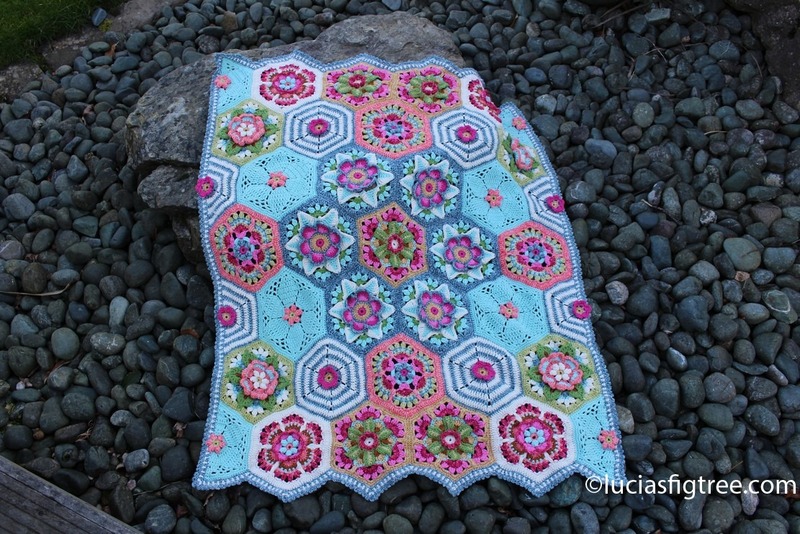 and I followed both CAL she made in collaboration with Stylercraft: the LILY POND and the original FRIDA, both of which I made the blanket in a larger size. Before working together I met Jane briefly at Ally Pally, Yarndale and at the Edinburgh Yarn Festival, as I always make a point to visit her lovely stall, and I always found her and Andy really polite and helpful regardless of the crowds that always surrounds them at shows. So when I became a Blogstar I was thrilled that she was part of the group and in February at, my first Blogstars meeting, I had a proper chance to chat with her. Jane was particularly interested in how I mix colors and yarns in my blankets. 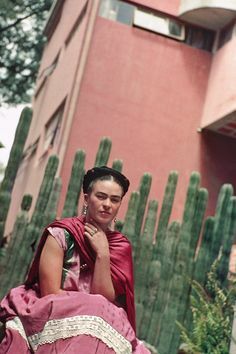 I didn’t think much of it, besides been really happy that she was so complimentary about my work, so when I got an email saying if I was interested in re-coloring the Frida I was like ohhh WOWWW!!! I said yes on the spot !! 3rdly because I love a challenge. Then reality settled in and I realized that I had to really raise my game. Blanket designing is my hobby, colors are my work and also my passion, I am very lucky in that sense as I do something I love, having said that it requires a great amount of work, research, trials and a baskets of failed attempts, now if it is just one of my blankets, I am not that fussed as it involves just myself, but working on a commission for someone else it is a totally different story. I started revisiting Frida Kahlo’s paintings, life, pictures, the environment where she lived, her friends, her house and her studio. I didn’t want to make a version that was either too pastel or too bright simply because pale hues will have been far too removed from what Frida and her work were about, and a prime colors version would have been far too similar to Janes beautiful piece. I settled for spring, sea, sun and flowers. How could I not incorporate the flowers which so often adorned her hair and clothes, the flowers from the beautiful gardens of Casa Azul, the ethnic jewelry with corals and turquoises, beautiful hibiscus and hot pinks from the bougainvilleas, colorful hummingbirds and the odd monkey or two. I made a few trials and what you see now is the final result of a lot of thought, trials and work; and I really hope you all think I gave both Frida and Jane justice. I have received a few emails requesting details on colors and the position of them, unfortunately, I can’t provide that because although they are my work and choice the copyrights are Jane’s. 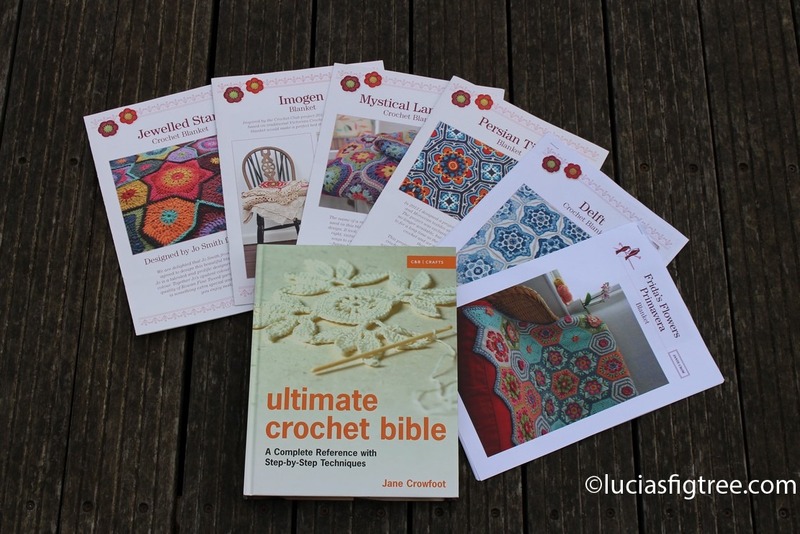 Jane and her team have spent considerable time and money transforming my crude list and details into a fabulous printed brochure which they supply as part of a kit with all the yarn you need plus the printed brochure. The brochure is 7 pages of details and close-ups, each motif has a round by round list of the colors. There is also a final color chart of the entire blanket and the position of the different hexagons. 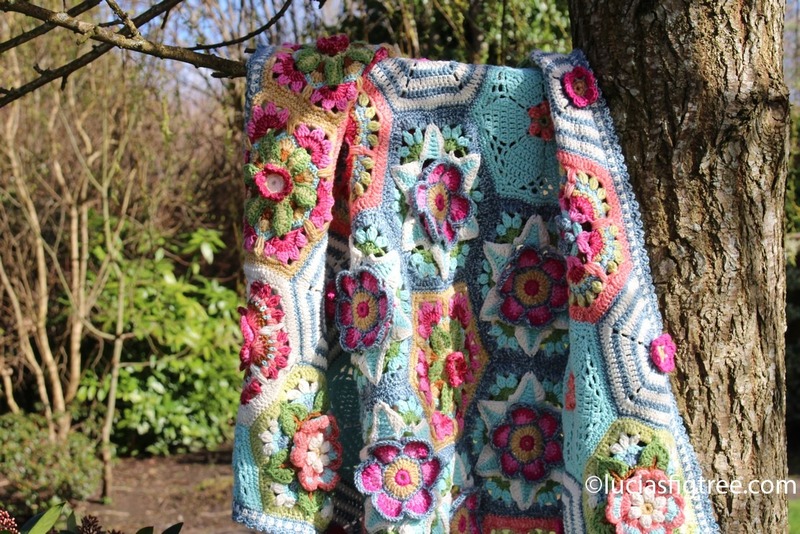 Finally, I hope you all enjoy my blanket, and I have to take this opportunity to thank Jane and her team https://janiecrow.co.uk/presta/ for giving me this opportunity and having faith in my abilities, and Annabelle and her team at Stylecraft https://www.stylecraft-yarns.co.uk/ for supplying copious amount of yarn for me to play with! As usual, Lucia, I LOVE your colors! 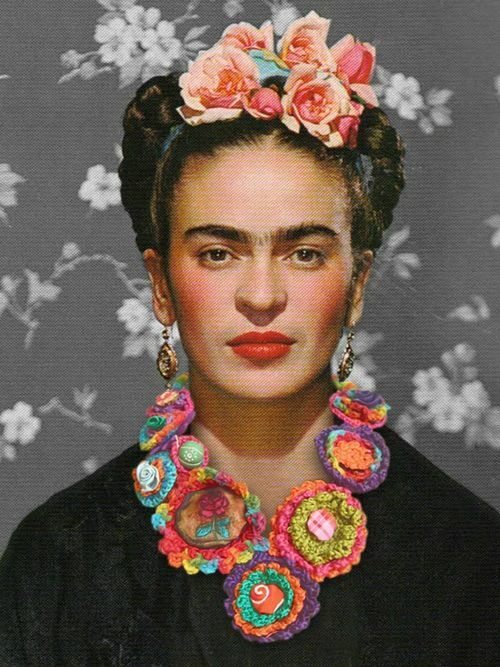 I am hoping to make the Frida….and I think I will choose the Primavera version! Both are gorgeous. Still have the Norlan and Macaroon on my list. I will happily be crocheting until the end of time! 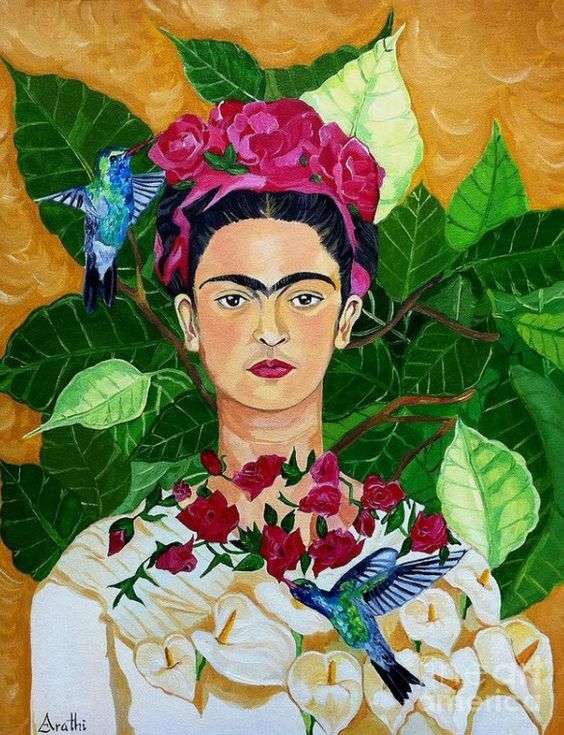 Last year i have made the first version of Frida. The Primavera version is really beautiful with these colors. I can’t wait to start. Can you tell me with yarn and how much of each yarn. I can not find it on the internet. 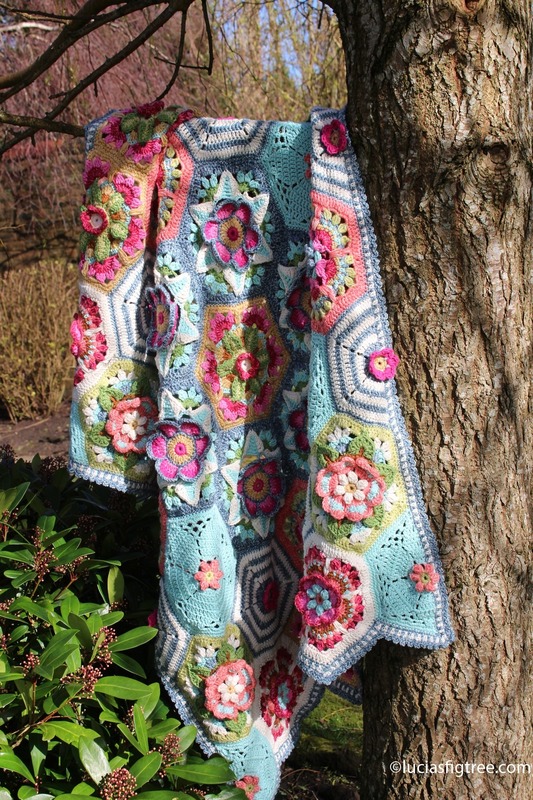 Please help I want to make this beautiful blanket in Primavera but I cannot find the colour list for this one . I have the original pattern. Janes site no longer do the pack which is fine but I need the colour mix. Sei riuscita ad estrapolare l’essenza di Frida, complimenti!!!!!!!! I adore your new colour scheme. Frida’s Flowers was on my ‘to-do’ list but I think now I will get the kit for this colourway instead, or maybe do both 🙂 I love your colours so much it make me want to make this blanket even more. Your sense of colour is indeed outstanding, Lucia. I admit I feel compelled to work on your version of the Frida blanket. Your colours give my eyes such a relieve, it’s hard to describe what your specific combination does to my soul. Yes, it’s going as far as that: affecting my soul. thank you, Ingeborg! I am so glad you like it, I made several attempts before getting to what you see, as I had to work the hexagons separately, so the colours combination it might look good standing alone, but sometimes it didn’t look right when added to the others hexagons, so there has been quite a bit of adjusting! I do love it, and I also feel the pictures are great but the ‘real thing’ is even better, it also feels lovely too to the touch, due to the fact that it is a combination of different yarns. so has not been easy but has been great fun! I simply like all of this. Keep going. I am very fond of your colourway and I want to “copy” it. Could you tell me please what yarn and how many of the different colours you used? I want to make it with Special DK. I live in Germany and it is very expensive to order from the U.K. I have made the blanket in the original colours and also in Special DK, I love this yarn. So please would you help me? Beautiful! I would really love to make this blanket, but I haven’t been able to find a printable pattern that I can follow step by step. Could you please help me! I promise I will send you photo once I have finished it! Thanks in advance. 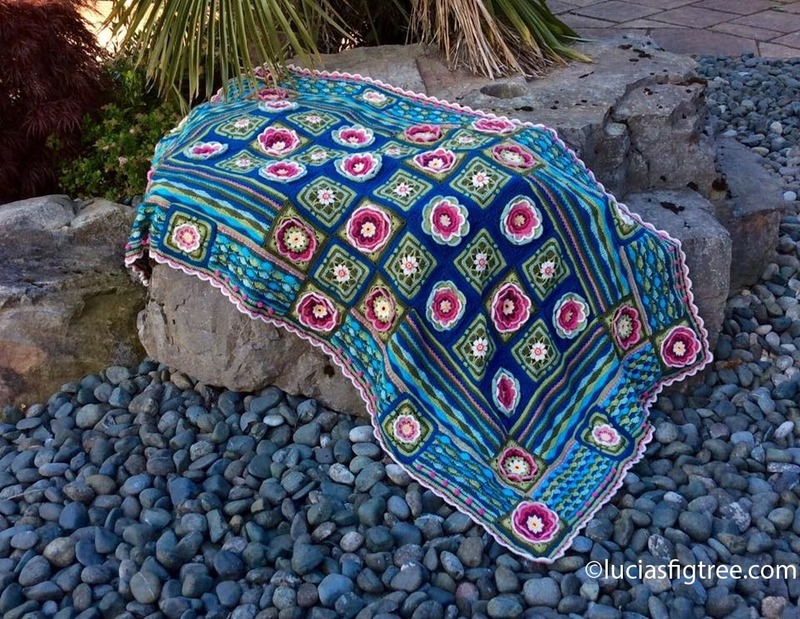 The original version of the Frida ‘s blanket pattern is available on line on the stylecraft’S website as it was last year CAL. My colors’ version, the Frida Primavera, I made it for Jane Crow and it is available, for the time being, exclusively as a kit from her website. this is the link https://janiecrow.co.uk/presta/crochet-along/422-frida-s-flowers-primavera-yarn-pack.html.